In 1958, Antonio Cioffi arrived in America along with his newlywed bride Santina. He came here with only twenty dollars in his pocket and the promise of the American dream. His hard work and a dedication to a passion for good Italian food has enabled him to make that dream a reality. Inheriting his business sense from his Father Gennaro, has enabled him to make Cioffi's the success it is today. From Pacific Street in Newark , to Styvesant Avenue in Union and finally to Springfield Cioffi's has been serving New Jersey with good quality Italian food for over 40 years. 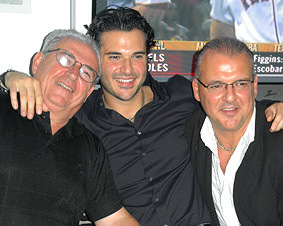 In keeping with the family traditions, today, the legacy of Cioffi's lives on through his sons Gennaro and Giuseppe. At Cioffi's our goal is to provide the most authentic Fine Italian Foods in the area. We pride ourselves on the quality of our food. Our specials are updated daily so be sure to check back to see what delicious items we are serving each and every day!